"Basically what was on the 35mm negative is a 32-page manual dated 1954, which describes for special field units how to recover crashed flying saucers, how to take them apart, how to pack them, where to ship them, how to take care of the bodies and how to keep the public in the dark." November 19, 2003 Las Vegas, Nevada - This past weekend in Las Vegas was the first Majestic-12 UFO Crash and Retrieval Conference produced by Ryan Wood, President, Majesticdocuments.com. His father, Robert M. Wood, spoke at the conference about why he is convinced that a leaked document known as the TOP SECRET/MAJIC Majestic-12 SOM1-01 Training Manual for "Extraterrestrial Entities and Technology, Recovery and Disposal" is authentic. 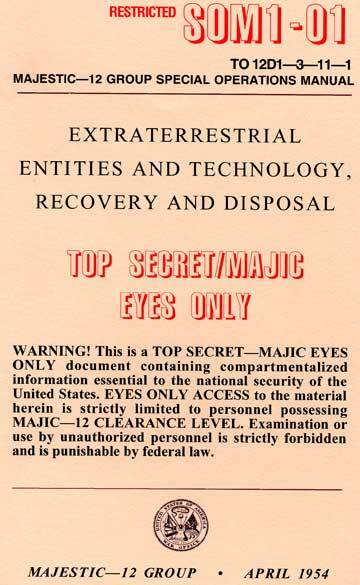 The training manual first appeared as 35mm black and white negative film in a package addressed to Don Berliner of the Fund for UFO Research in Maryland. The package was postmarked March 7, 1994 from LaCrosse, Wisconsin, and bore a return address of a pharmacy in LaCrosse. On the 35mm film were thirty-two pages of text and drawings and the fingers of whoever photographed the pages of the TOP SECRET/MAJIC classified manual.